Growing up near Detroit and being interested in the paranormal field for many years, Jimmy's had many experiences after the passing of his parents and finally decided to get involved in the research and investigation of the paranormal. After studying and getting Certified in Paranormal Investigation (CPI) through ParaNexus Academy, he started looking for local groups to get involved with and eventually teamed up with Cryptozoologist Raven Meindel. Raven was in the process of forming the paranormal investigative group Moonshadow Investigations and offered Jimmy the position as her Co-Founder. Together they made quite a team and created a great paranormal group by adding extremely talented members. But within a couple of years, Raven made a difficult decision to seek out other avenues and Moonshadow disbanded. Jimmy then decided to form Goosebumps Paranormal Society on his own and continue with the paranormal research to help others determine and define the activity going on in their lives. He was extremely happy and honored that most of his former Moonshadow Investigations team decided to stay with him on his new quest. His dedication to paranormal research and investigation is the solid foundation and core to this amazing group. He now lives in Pittsburgh and runs both the Michigan and Pittsburgh units. Jimmy has also been a guest on WMBS Radio along with the producers of Animal Planet's "Finding Bigfoot" and Pennsylvania Bigfoot Society's Western Sector Director David Dragosin and interviews on Pittsburgh's Star 100.7 and Bob FM 96.9. He's also a writer, photographer, motorcycle enthusiast and outdoorsman and writes about his adventures in the wilderness, most of which are quite humorous. Jimmy recently finished his first book, a heartwarming fictional story entitled "GUILT TRIP" and it's available on Amazon. Click this link to get your copy! https://www.amazon.com/Guilt-Trip-James-Trick/dp/1547256931/ref=sr_1_3?ie=UTF8&qid=1503355050&sr=8-3&keywords=guilt+trip You can find many of his writings and adventures on his website at www.writing.com/authors/blucyote. A love of photography and paranormal activity are what brought Dee to join our organization. With over 20 years of experience as a professional photographer, a zeal for life and anything out of the ordinary, Dee is a natural fit. Specializing in documentary photography and videography, her attention to detail ensures that no stone is passed over or unturned and everything she and the team encounter is documented. Living in Pittsburgh for her entire life makes Dee quite familiar with the nooks and crannies of the very active paranormal hot spots of Western Pennsylvania. She was anxious to explore these areas, thrilled to find our group and eagerly became a member. The Pittsburgh Unit was in need of someone to take control of the audio and video documentation, and with her background and enthusiasm there was no question we needed her onboard. Dee’s fun personality makes her a perfect addition and we’re excited to have her on the GPS Pittsburgh team. GPS founder Jimmy and Dee have worked extremely well together as a team. They decided to make the "team" a permanent one and were married in May of 2014. It's an honor to have Dave on the GPS team. Dave, or "Big Daddy" as he's known to many people, is the former Director of the Pennsylvania Bigfoot Society Western Sector and currently the Keystone Bigfoot Project Director Emeritus & PR Consultant, researching and investigating reported sightings of Sasquatch/Bigfoot. He's a Forensic Artist and has drawn extensive renderings of the sightings that have been reported in the Southwestern Pennsylvania area. He and his colleagues perform Bigfoot presentations at conferences and radio programs all around the area. He has a remarkable professional background that involves many things including, but not limited to, outdoor video media production and with his unique voice has done many off-camera voice-overs for radio and TV. Dave also has been the Host, Producer, Engineer and General Manager at various AM and FM radio stations and once you meet him you'll realize his love for stand-up comedy. He has a tendency to "lighten the air" in a tense environment. It's a pleasure to have Dave and his antics in our Pittsburgh group. Sounds like a comedy team, doesn't it? Dave and his Antics? Eric has had a lifelong interest in the strange and unusual. Being a fan of horror and science fiction movies, he spent a good portion of his childhood watching films from this genre. In 1980, Eric saw two films that would inspire him to begin to closely study monsters and unusual animals. The "Legend of Boggy Creek" and "Creature from Black Lake" became his catalysts to studying the Bigfoot phenomenon. In 1983, he met his mentor, Stan Gordon, studied under Stan's tutelage and has worked with Stan on many cases. Eric also formed the Southwestern Pennsylvania Bigfoot Study Group and was also chosen to become a volunteer field researcher for the Bigfoot Field Researchers Organization - the BFRO. He was appointed the point of contact for Pennsylvania by Matt Moneymaker, founder of the BFRO and star of Animal Planet's "Finding Bigfoot." In 1999, he became a member of the Pennsylvania Bigfoot Society and was appointed Director. 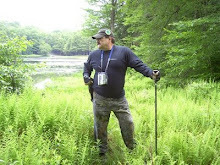 Eric has served as the host and organizer of eight East Coast Bigfoot Conferences and co-organized and co-hosted the 2011 Pittsburgh UFO/Bigfoot Conference with the Pennsylvania Chapter of MUFON. He has been featured in dozens of books about Bigfoot and the paranormal, interviewed by countless newspapers and magazines and appeared in over 100 radio interviews and numerous television programs. More recently, Eric has been featured in the 2012 documentary film "American Sasquatch Hunters: Bigfoot in America" and the 2014 film "Mountain Devil: The Search for Frank Peterson." Aside from media appearances and field research, Eric also travels around the country for lectures at schools, clubs, organizations, meetings, Bigfoot and Cryptozoology conferences and events. In 2007, Eric co-founded "Beyond the Edge Radio" with Sean Forker and is the program's host and producer. He is currently writing a book about the Bigfoot sightings and phenomenon in Pennsylvania. We're excited to add Eric to our great team at GPS. Mace hails from Slippery Rock, Butler County in Western Pennsylvania and has had a lifetime full of paranormal phenomenon and other experiences, as well as cryptozoological experiences. With his heightened awareness and sensitivities to unusual phenomenon, he has always had a fascination and yearning to investigate and participate in paranormal activities, while providing all the respect due to this field of investigation. Mace holds fast to respecting those who have gone before him into the spirit world. His interests include Native American History and legend (particularly Northwestern PA), most things outdoors, from canoeing and kayaking to hiking and rustic camping and often finds himself in places that lead to further investigations. Butler County has a rich history and is a hub of paranormal phenomenon, haunted places, historic legends and cryptozoological occurrences. Often times his experiences are just by happenstance....during the work day or taking a hike, not during a scheduled outing to do an investigation. Having formed new relationships and friendships over the past few years have brought a more formal tone to his research and he is glad to become a member of Goosebumps Paranormal Society and hone his skills further, adding to the capabilities of GPS. We welcome him as a great asset to the group. Cindy lives in Elizabeth Township, southern Allegheny County and has gypsy blood in her veins. This gypsy blood has led to a lifetime of psychic "feelings" that would often manifest themselves in providing safety to others, being wary of road hazards or animals running onto the road, all before happening. Learning to respect these "feelings" and move from predictions to more paranormal sensitivities over her lifetime took some higher power intervention and she has learned to tread lightly into the paranormal world, knowing there are very dark and dangerous forces out there....also knowing that there are other things out there, much more than the eye can see. Cindy, too, has launched into cryptozoology investigations with Mace and together they have begun an independent research team focused on a small area near Mace's home. She looks forward to losing some of her fears - of the dark, of the unknown - and exploring more of her abilities to be sensitive to the paranormal and use them as a benefit to Goosebumps Paranormal Society. We love having Cindy on the GPS team. Jimmy has also been a guest on WMBS Radio along with the producers of Animal Planet's "Finding Bigfoot" and Pennsylvania Bigfoot Society's Assistant Director David Dragosin. He's also a writer, photographer, motorcycle enthusiast and outdoorsman and writes about his adventures in the wilderness, most of which are quite humorous. Jimmy recently finished his first book, a heartwarming fictional story entitled "GUILT TRIP" and is available on Amazon. Click this link to get your copy! https://www.amazon.com/Guilt-Trip-James-Trick/dp/1547256931/ref=sr_1_3?ie=UTF8&qid=1503355050&sr=8-3&keywords=guilt+trip You can find many of his writings and adventures on his website at www.writing.com/authors/blucyote. June has been conducting research into the paranormal for several years. She has had her own paranormal encounters which inspired her to make a decision to dedicate her time and effort to help others and try to explain the phenomena so many people (and animals) are experiencing, but where very few answers can account for what is really going on. When June met Jimmy Trick, she was delighted to find a local paranormal group and was pleased to join. June has knowledge of background research, equipment functions, evidence analysis, customer service and computer skills along with her own personal experiences and blends in well with the GPS group. She also enjoys working with animals and is a supervisor at a local pet resort. June shares her life with three rescued dogs along with two European Starlings and is working on a degree in Veterinary Technology. One phrase best descibes Jess...an analytic professional. She is dedicated to studying and analyzing information, can observe people and situations for hours and learn everything about them and their surroundings from their actions, conversations and relativity. This is critical when it comes to paranormal analysis, which makes her a perfect fit for this unique team of investigators. Her love of photography and video has earned her the position of Team Photographer/Videographer and she is a great assett to the GPS team. Jessica's other personal interests include drawing, painting, riding horses and really anything to do with the care and quality of horse life. Since she was a young child, Kathy has been sensing entities and the presence of spirits. She's had numerous personal experiences throughout the years, some comfortable and others, well, not so comfortable. Keeping these experiences to herself is what she did for most of her life, for fear of ridicule and embarrassment. But after marriage she eventually decided she could confide in her husband the things she suppressed for so many years. After a few unexplainable events took place, her husband knew there was something to what she was sensing. Throughout the past years, Kathy continues to experience the presence of entities or earthbound spirits and has learned to be more aware of her surroundings and trust her instincts. She has even learned to communicate with the entities to a certain degree. Kathy's ability to sense spirits and energies is paramount to GPS during an investigation. Being able to communicate with the spirit world places her above the rest and is well received by her fellow team members. She is also an accomplished writer and along with her husband has written and published two mystery books, "Palm Monday" and the sequel "Conch Waves" and is currently working on a third book. A crypto-zoologist who conducts a great deal of research, Raven writes for the Centre for Fortean Zoology and is Vice President of the North American Fortean Society. She also has been a guest consultant and investigator on a recent episode of History Channel's "Monster Quest" while searching for the infamous Michigan Dog Man. Raven and well known cryptozoologist Nick Redfern teamed up together for a radio show entitled "Exploring All Realms" and she can be found on her own website at www.cryptohaven.com. Raven and former Moonshadow Investigations Co-Founder/GPS Founder Jimmy Trick remain close friends and she will be available to the group for crypto consultations and occasional investigations.